A blog where you can read a myriad of articles from diverse fields such as economy, psychology, philosophy, science, history etc. Have you ever judged someone just by looking, on what their belief are or what they are capable of doing? If yes, what trigger these thoughts? Before we examine the thought process, let's understand the underlying factors. These factors might cause us to help another person or harm them or even fear them. 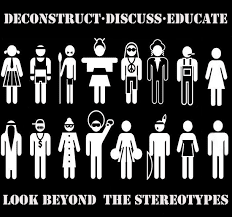 People often judge others based on their group affiliation through stereotype, prejudice and discrimination. Let's take a closer look at each. Many people associate intelligence with glasses. Now this is positive till we don't expect all people with glasses to be intelligent. Another stereotype can be teenager love to play video games. Issue arises when this pattern becomes an expected behavior. Just because someone wears glasses doesn't mean he/she is intelligent. Similarly just because one is teenager doesn't mean he/she loves to play video games. We all have been unfairly judged in our time and at the same time we too have done uninformed judging. Prejudice is a common human condition. Prejudice is formed of two words 'Pre' and 'Judge'.It basically means forming an opinion on someone or something before having all the facts and evidences.It's a thought or feeling that you hold internally and doesn't always leads to an action. For example, let's assume you have a stereotype belief that women can't fly an airplane. Now you form a prejudice that men are better suited for the job of pilot. But you may not act on it and hire anyone based on their talent irrespective of their gender. But if you decide not to hire a woman pilot because of your prejudice, then it becomes discrimination. Prejudice attitudes are often directed along the lines of gender, ethnic, socioeconomic status, culture or age etc. This means you go so far as to treat people differently based on your prejudice. Discrimination ,basically, involves putting group member at a disadvantage or treating them unfairly as a result of their group membership.The formal apartheid system of racial segregation in South Africa, the Nazis' mass killing of Jewish people and other group and centuries of bloodshed between Protestants and Catholics are all extreme examples of violent form of prejudice and discrimination. Prejudice and discrimination can be non-conscious. These are based on your implicit thoughts. To understand these we have implicit association test (IAT) . This test was implemented in late 1990s to try to gauge the implicit attitudes, identities, belief or biases that other people are unwilling or unable to report. You can take the IAT online and measure your implicit attitude in all kinds of topics. So that's one way to measure subtle,implicit prejudice. But these implicit prejudice is far from dead and thus discrimination studies are prominent is social psychology research. Discrimination studies sometimes predict with accuracy how discrimination might show up in broad social patterns like wage inequality, job opportunity gap or unfair justice system. According to a 2013 Pew Research Center survey, blacks perceived racial biases to be much more greater in criminal justice system than other institutions. Seven-in-ten blacks said that black were treated less fairly when dealing with police compared to whites. In comparison, 37% whites held that view. Also, 68% of blacks told that the court system was unfair to them, far more than whites(27%). Now it's too easy to give examples to demonstrate how people are prejudiced but the real root of the issue lies in why they are prejudiced. Some of the possible answers might be that prejudice can be seen as a way of justifying social inequalities. This happens when people on both sides of spectrum starts believing that people get what they deserve and deserve what they get. This is called the "Just-World Phenomenon". This ideology is pervasive across countries. Prejudices can also be driven by "Us" vs "Them" or as psychologist call it ingroup-outgroup phenomenon. When many people think of casteism or racism or any other form of bias, they tend to think it's chiefly because of negative feelings towards other group. But research since 1970s have shown that many group biases are more a function of favoritism towards one's own group than negative feelings towards another group. The tendency of people to favor their own group is known as ingroup bias and has been found across cultures around the world. One of the startling fact regarding ingroup bias is how easily it's triggered. There were a series of experiments conducted between 1970 and 1981 by Henri Tajfel in Briston, England. In these experiments, people were divide into two groups based on minimal information like a preference for one type of painting vs another, or even just the toss of the coin. What Tajfel discovered that within minutes of diving into groups people tend to see their own group as superior and frequently seek to maintain an advantage over other groups. Soon enough, each group has inflated itself and derided the other group, even though division between the two was meaningless to begin with. 1. One-on-one interaction: If you get to know someone as a person, you get to see beyond those stereotypical things that you have formed in your mind. You will start thinking, hey this isn't "them" this is my friend, I know about him. 2.When you recognize your prejudice and stereotype you can act on them. 3.When you starts celebrating the fact that people being different is a good thing. It adds to "Us" rather than taking anything away. Economic and Strategic significance of Indian Ocean Region.